At first glance, you may not think that machine learning or AI have much to offer to an asset management firm. In reality, though, asset managers stand to benefit enormously from advances in AI and machine learning. There’s just one problem, though: your standard CRM or point solutions (be it Protrack, Salesforce, Satuit, or any number of others) don’t offer this sort of functionality. Fortunately, there are asset management platforms out there that are capable of harnessing the power of machine learning and AI. Particularly when it comes to asset management, it’s essential to find a platform that’s been built by experts who understand the unique needs of the industry. With the right platform, you’ll be able to dramatically increase your efficiency and offer your clients more value than ever before. AI and machine learning can afford you all sorts of advantages, including added insight into wholesaler and retail line of business logistics, help with managing RFPs and institutional pipelines, and more. In this blog, we’ll dive into one way that these technologies are particularly useful for asset managers: trip planning. As an account manager or sales person, you’ll find yourself traveling on a regular basis. After all, maintaining personal relationships with advisors and exploring opportunities for new business is essential. As anyone who’s done this will tell you, though, attempting to sort through the logistics of these trips is a huge time sink. Any given city offers hundreds of potential prospects, and deciding when, where, and who to meet is a challenge. In a perfect world, an account manager would take into account all available data -- including dozens of variables related to the potential payoff of meeting with any given advisor -- and make a purely logical decision that maximized their time and other resources. The reality, though, is that this sort of calculation isn’t the kind of thing that an account manager can do with complete accuracy. Why? Because account managers are people, not computers. Fortunately, though, machine learning and AI offer the potential to execute this task with extreme precision. Rather than leaving it up to an account manager to determine where they’ll go and who they’ll interact with, AI can call the shots. With AI and machine learning, there’s no guesswork involved in determining where to go and who to meet with. 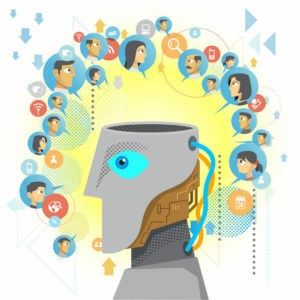 Instead of an account manager picking and choosing the clients who they prefer to see (and avoiding the ones who can be difficult to work with), the AI technology will set up an ideal meeting schedule. That being said, it’s worth pointing out that the human element is still preserved in this whole process. The AI program will put together a recommended list of meetings, but it’s ultimately up to the human account manager to review it and make adjustments as needed. The point isn’t for machine learning to completely take over the whole process. Rather, the goal is to combine the best of both worlds: the AI’s capability to sort through massive amounts of data on the one hand, and the account manager’s ability to personalize and adjust their trip on the other. One of the best things about using machine learning to plan trips for asset managers is the huge amount of time that’s saved. Normally, an account manager would have to look through a long list of clients, evaluate which are the most profitable and important to meet with, determine what’s practical to accomplish within given time constraints, and then attempt to construct a trip that makes sense logistically. AI and machine learning cut out all of these steps, providing the account manager with a shortlist that they can evaluate right away. Email, smartphones, mobile Internet access, and other technologies make our lives better each and every day. In the same way, AI and machine learning can save us time, help us make better choices, and accomplish tasks that are beyond the scope of human capabilities. Years ago, machine learning and AI were little more than science fiction. Today, the reality is that integrating these technologies into your business is essential if you want to stay ahead of the competition. Ready to learn more about how machine learning can help your business? Contact AKA Enterprise Solutions to speak with a Financial Services expert today.